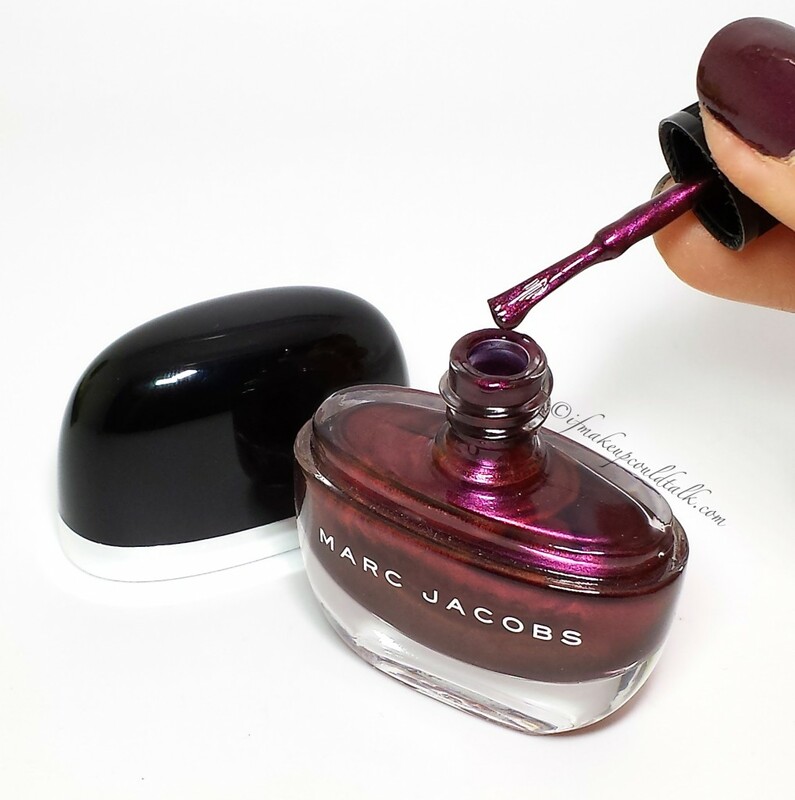 Just say, “Heck Yes” to Marc Jacobs Wine Not Nail Lacquer. 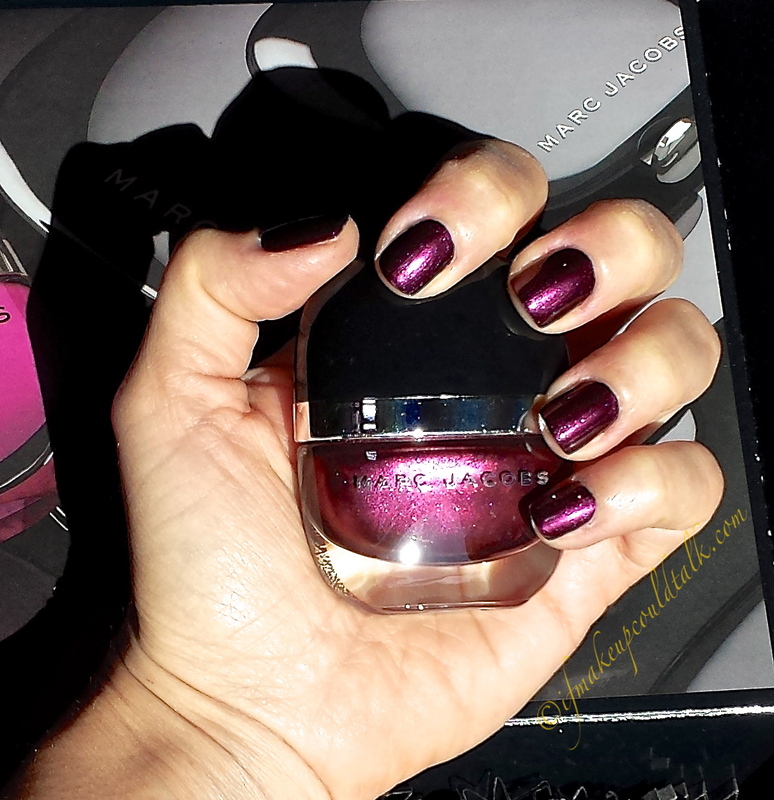 Marc Jacobs Wine Not Nail Lacquer photographed with indoor lighting. Wine Not is a gorgeous deep bordeaux color with a sophisticated metallic sheen. The primary combination of purple and red mixed with the finest matching pearl, gives the color a fiery depth. When viewed indoors the color deepens, but never to the point were it could be mistaken for a black polish. On the contrary, Wine Not is quite distinctive, it emits a fantastic crimson radiance from every angle. Marc Jacobs Wine Not Nail Lacquer photographed against full sun exposure. Wine Not’s luminosity truly comes out in full force when exposed to sunlight. I mean look at this color, the effect is downright stunning. The color shifts from a playful deep wine to an enchanting scarlet hue right before your eyes. 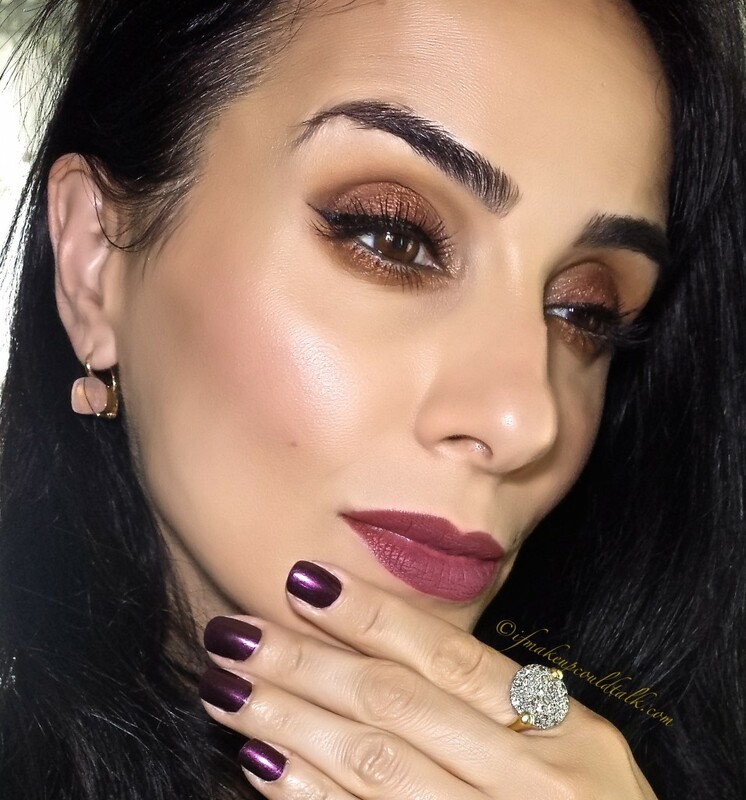 This is the type of color that can be worn all year round, against a variety of skin tones and for any occasion. Lighter polishes seem to dominate during the warmer months, however no one will dispute how chic and classic this polish looks even for this time of year. The formula has a substantial texture that applies evenly and smoothly–two coats was sufficient for full opacity. The dry time is also noteworthy–I felt as if my manicure ended before it even began–my nails were dry in 35 minutes. Normally, with other polishes drying time ranges between 1-1½ hours. For those of you wondering, my polish routine is rather basic, consisting of two other products that are rather affordable and accessible. I start with one coat of my base coat (Nutra-Nail here), followed by two coats of Wine Not, concluding with a top coat (Sally Hansen Insta-Dri here). Viola–35 minutes later beautifully polished nails. Marc Jacobs Wine Not freshly applied. Marc Jacobs Wine Not on the fifth day. 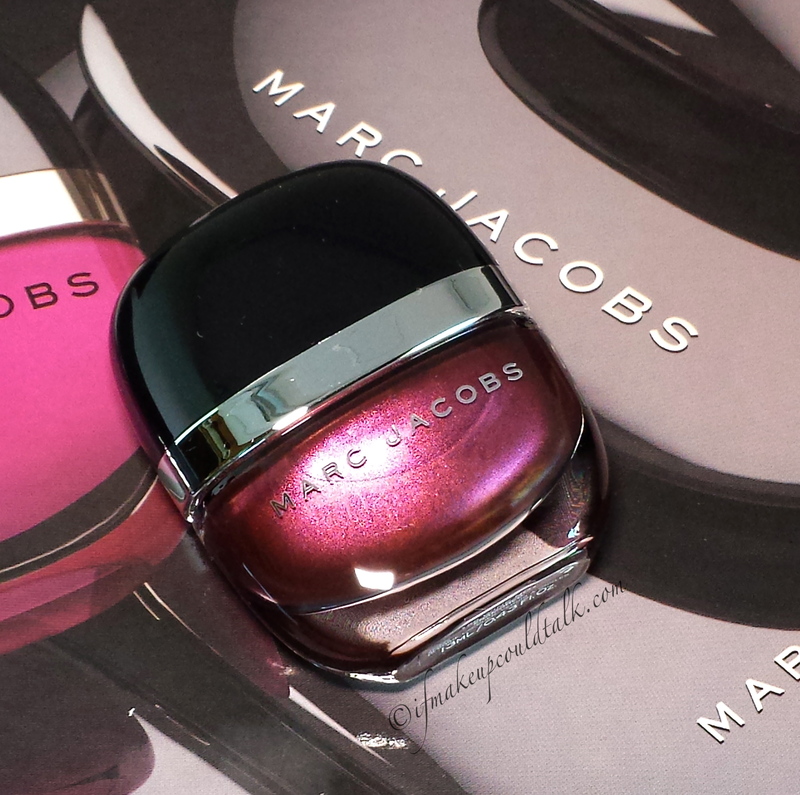 The wear time of Marc Jacobs’s nail lacquers are fantastic (reviewed Sally here) . I managed to successfully wear this polish a full six days with minor tip wear and no chipping in sight. The first photo shows how Wine Not appeared on initial application against my olive complexion. The second photo shows how well the polish held up amidst days of cooking, cleaning, and etc. A top coat was reapplied on the fourth day to refresh the shine of the polish. (FYI: wearing rubber gloves while doing house chores helps preserve your manicure and the overall appearance of your hands). Marc Jacob’s nail lacquers are touted as high shine; however, in my experience, they possess the same amount of shine as any other polish–a top coat is definitely needed. Ingredient List for Marc Jacobs Wine Not. 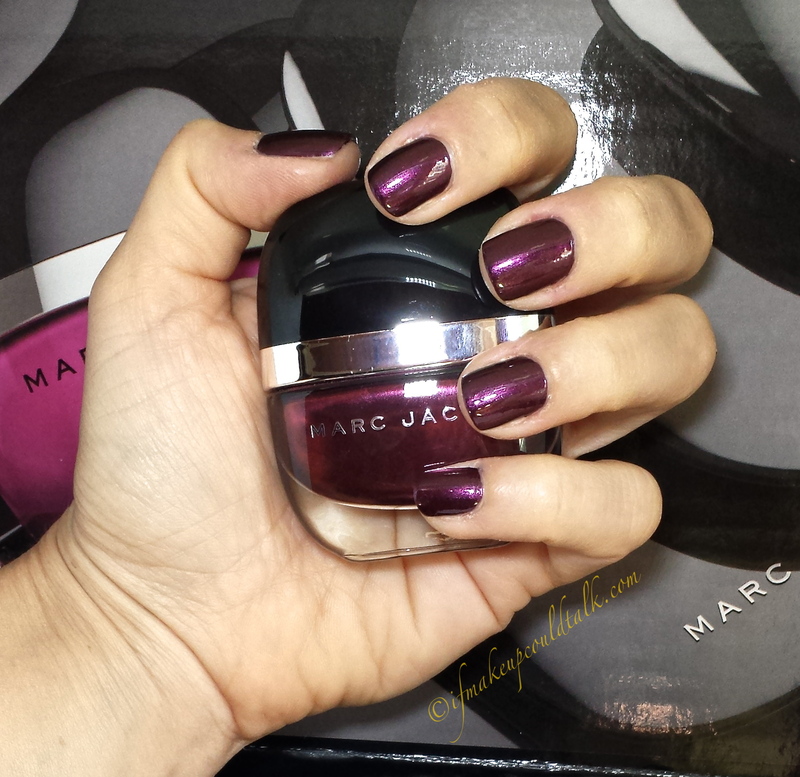 Makeup would tell you Marc Jacobs Wine Not Nail Lacquer is one of the most captivating colors of the year. The supple formula, fantastic wear, fast drying time and exquisite bottle design has definitely given me reason to go back for another color. Will you be saying, “Heck Yes” to Wine Not or let this beauty slip away? Until next time, be well, stay safe and be happy. Giorgio Armani Eye and Brow Maestro 2 Wenge Wood (here). Mally Beauty Topaz Stick Eyeshadow (here). Laura Mercier Cocoa, Khaki and Rosegold Caviar Sticks (here). Maybelline Lash Sensational Mascara (here). Sephora Rouge Infusion Lip Stain in 7 Strawberry Tint (2 thin layers blotted) with one coat of Girlactik Demure Matte Lip Paint on top (here and here). Pomellato Pink Quartz Nudo Earrings (this color sold only in-store other colors here).